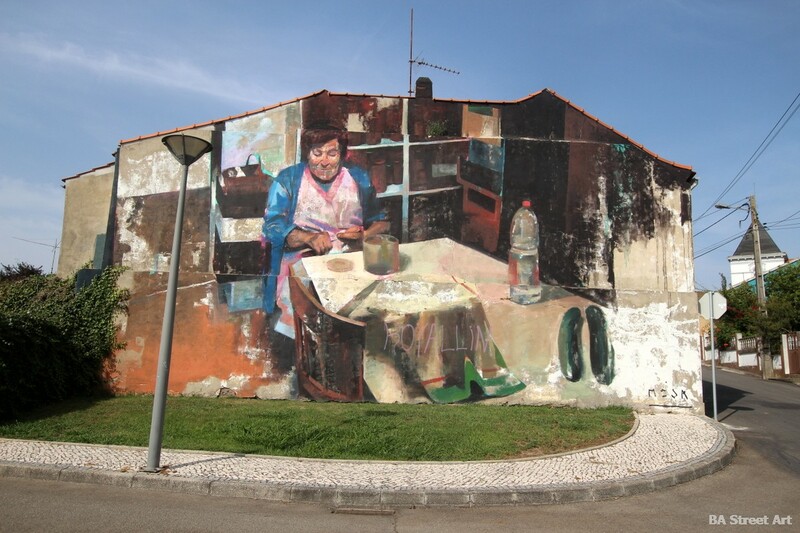 Estarreja, Aveiro and Coimbra boast some great street art and graffiti. 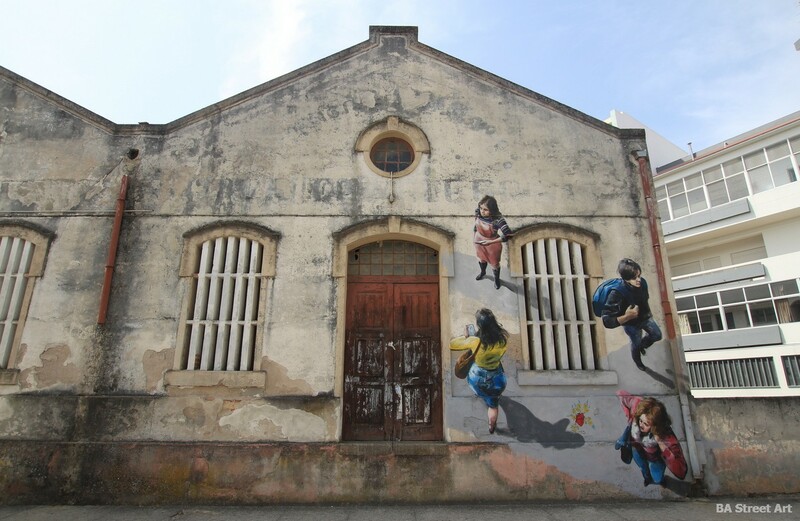 Buenos Aires Street Art‘s Matt Fox-Tucker took these photos during a drive from Lisbon to Porto. 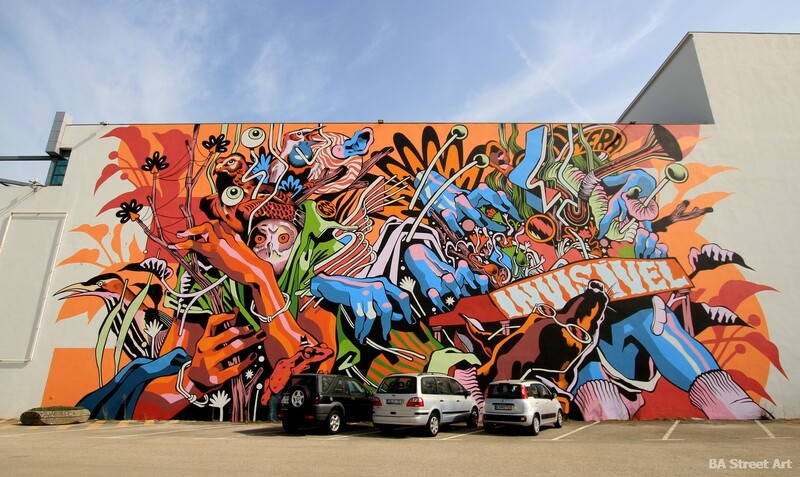 Many of the murals painted around Estarreja were painted for the street art festival organised by ESTAU | Estarreja Arte Urbana in 2016 including this one by Brazilian artist Bicicleta Sem Freio (above). 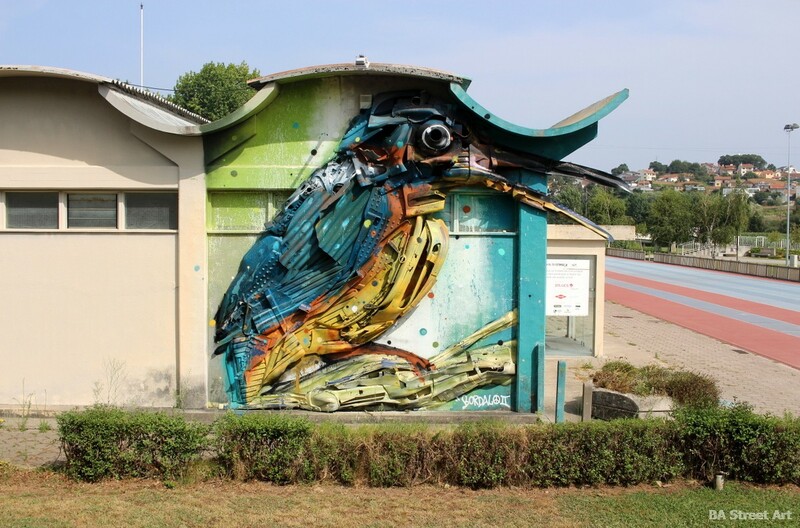 Portuguese stencil artist João Samina painted this electricity substation on the road into Estarreja in 2016 and has painted other murals in towns in the north west of Portugal including Coimbra. 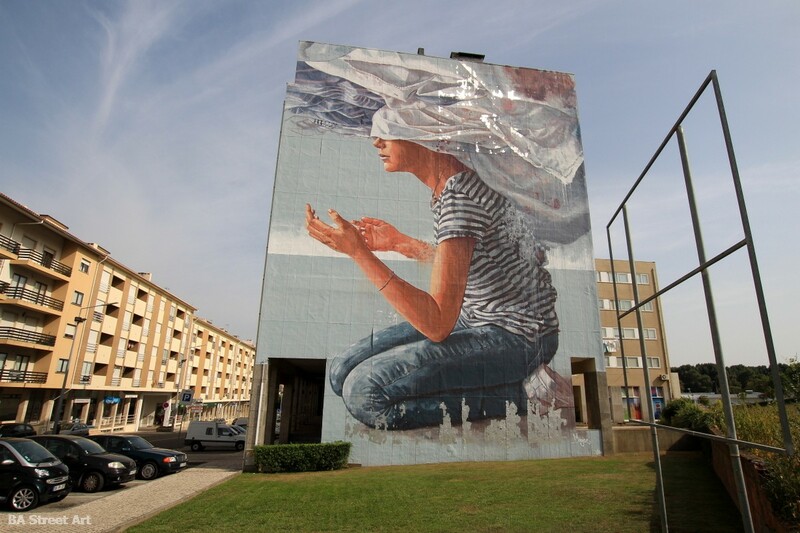 This mural called ‘Head in the Clouds’ in the centre of Estarreja was painted by Australian street artist Fintan Magee in 2016. 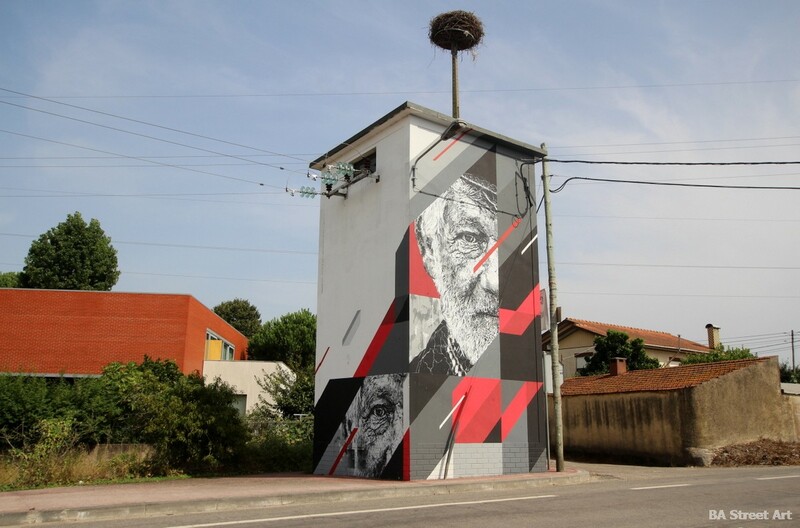 Spanish street artist Manolo Mesa painted this mural in 2017 at ESTAU. 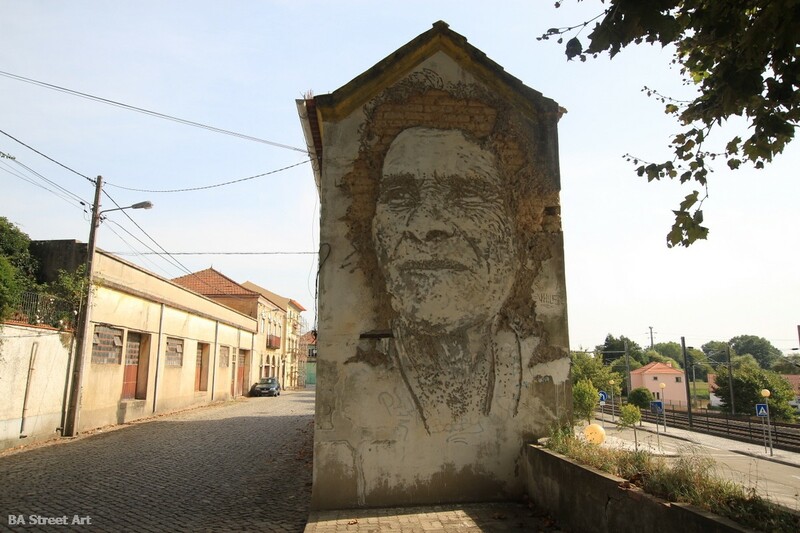 Vhils was inspired to create this artwork depicting a local woman Dona Florinda in 2017. She who was one of the last people to cultivate rice in the area using traditional farming methods. Aveiro railway station is really worth a visit. 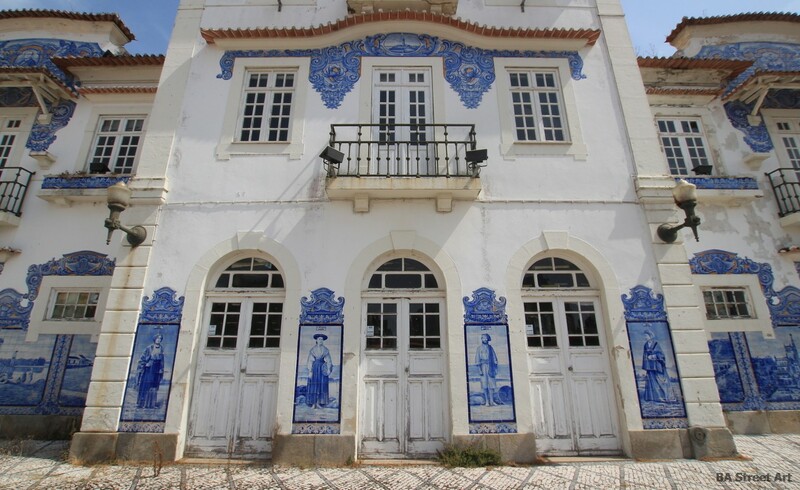 It was built in 1861 and beautifully decorated with blue tiles, (azulejos) with landscapes showing life in the city. Unfortunately the station was closed for restoration when I was there but you can get close enough to appreciate the splendour. 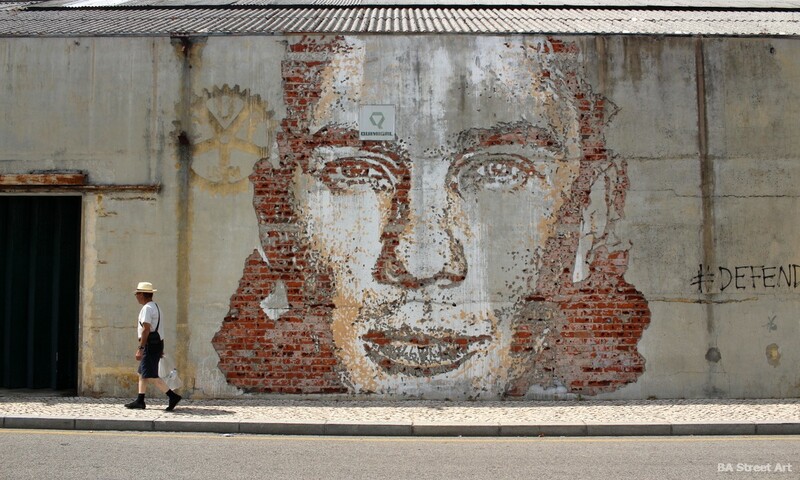 Thirty metres or so along the station road Rua do Dr. João de Moura is a mural by Vhils that was created by the Portuguese artist in 2012. 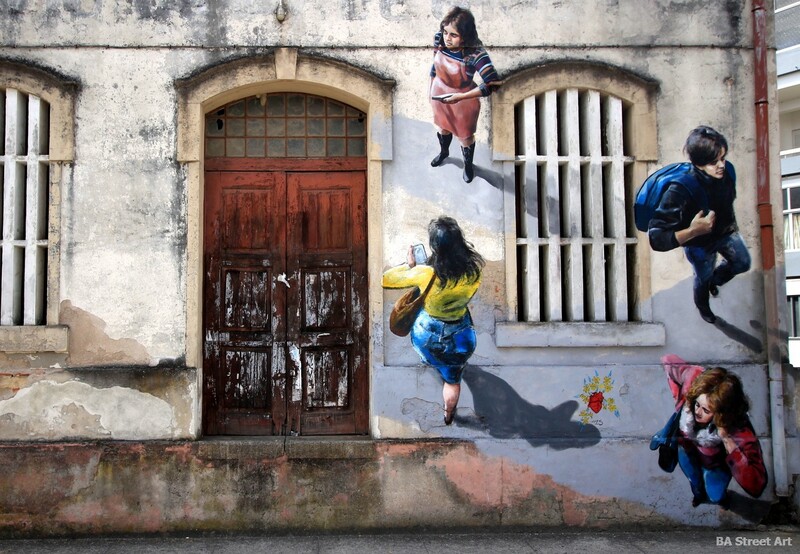 Love this mural by António Conceição depicting four young people on the facade of an abandoned building. The shadows create an optical illusion and the figures appear to be walking on the wall with the onlooker having a bird’s eye view. 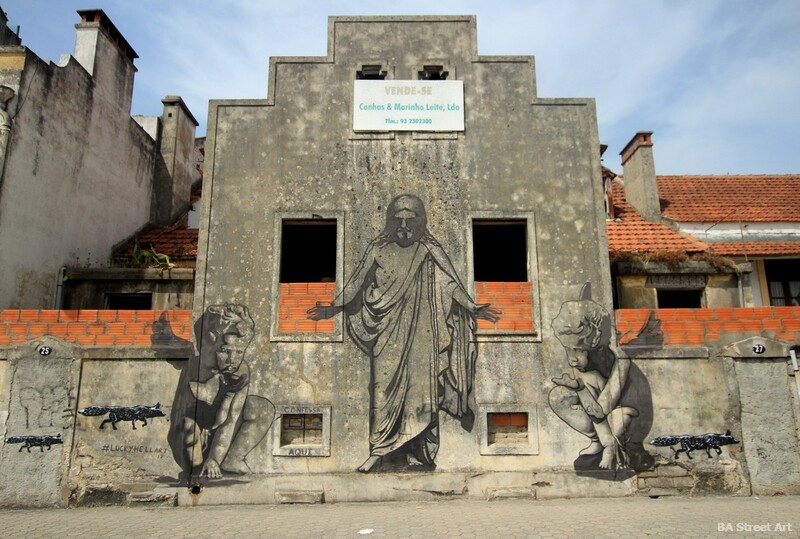 Opposite a municipal car park on the facade of a bricked-up building, Luck Hell Art painted this figure of Jesus Christ flanked by two angels. One of the basement windows that is blocked up has been turned into a confession box with the phrase “Cofessa aqui”. 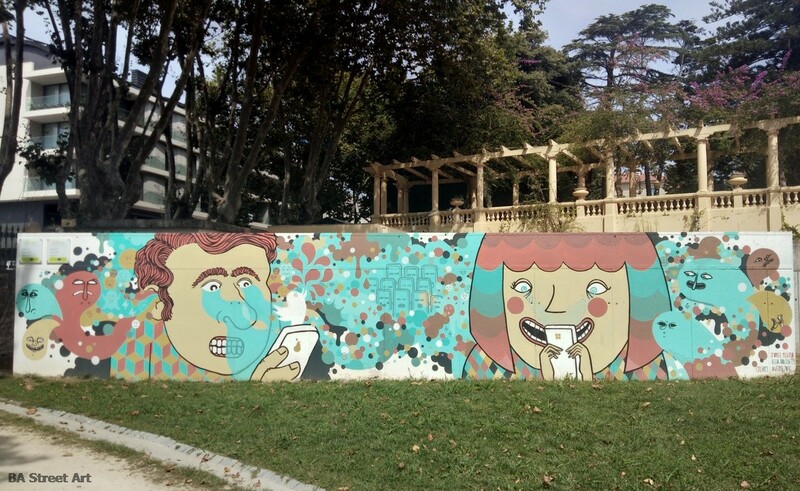 This fun mural entitled “Oxymoron”was painted in a park by Spanish artist Jorge Peligro and Icha Bolita in October 2016 for the project CreArt and is about opening a debate about how cellphones and new communications technology can isolate people from one another. Take note! 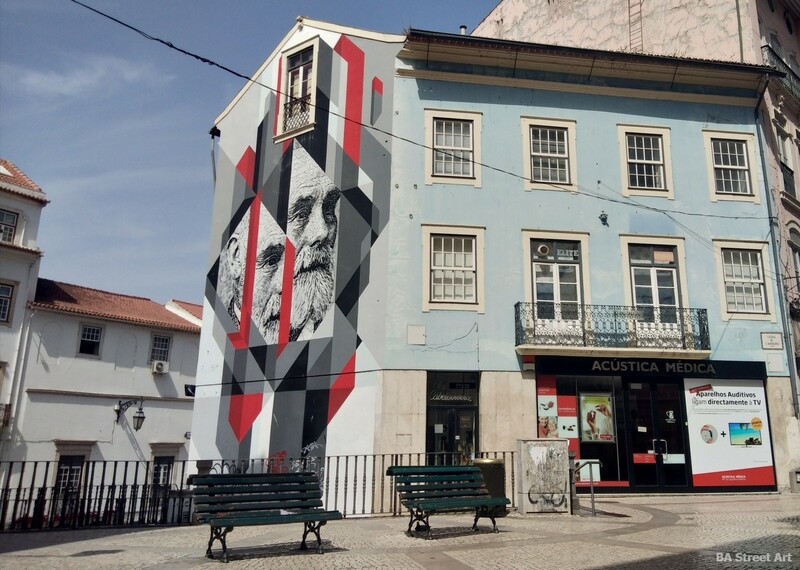 In 2016, João Samina was invited to paint a huge portrait on the side of a building on Rua Ferreira Borges for the art project ‘FIO memórias como matéria prima’ relating to preserving the history of the Saint Francis Convent that was converted into a wool factory from 1888 to 1980. The building is now run as a cultural centre. 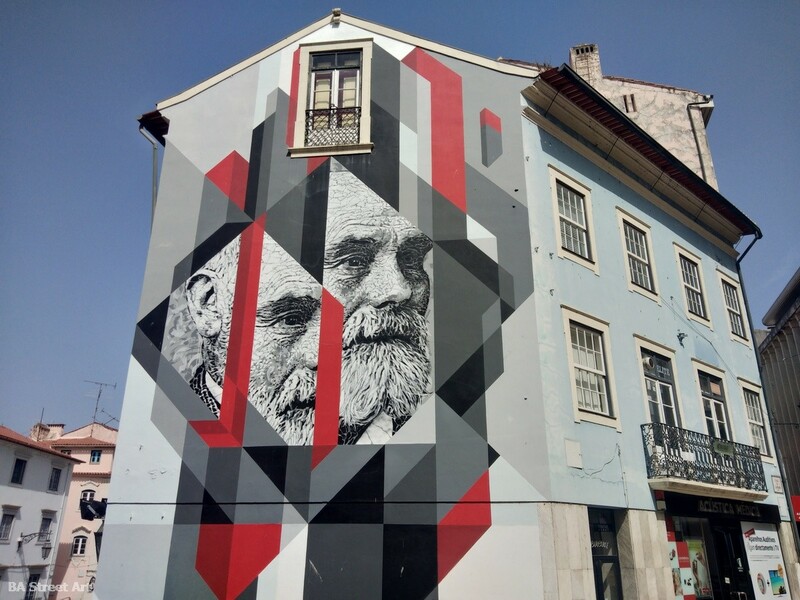 Also check out our guides to checking out street art in Porto and street art in Lisbon. 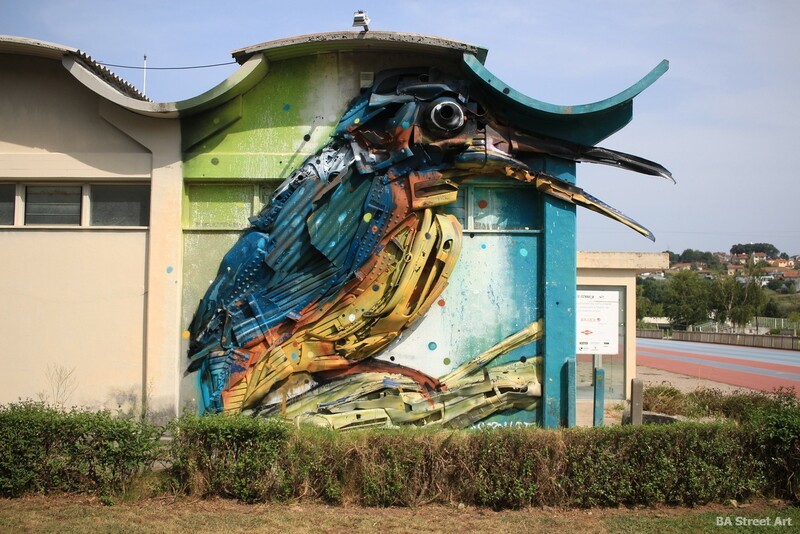 This entry was posted by admin in News, Street Art Cities and tagged António Conceição mural Aveiro, Aveiro murals, Aveiro street art, Bicicleta Sem Freio, Bicicleta Sem Freio mural Estarreja, Bordalo II kingfisher, Bordalo II mural Estarreja, Coimbra street art, Estarreja street art, ESTAU Estarreja Arte Urbana, ESTAU street art festival, Fintan Magee mural Estarreja, Icha Bolita mural, João Samina, Jorge Peligro mural, Lucky Hell Art, Lucky Hell graffiti, Manolo Mesa mural Aveiro, Manolo Messa mural, Manolo Messa mural Estarreja, Manolo Messa street art, Street Art Cities, Vhils mural Aveiro, Vhils mural Estarreja.